This post is part of a series on the four Cardinal Virtues. For the other posts in the series, click here. At some point or another, we all encounter things in life that cause us to be afraid. Whether it’s sudden unemployment, making a life-altering choice, a sudden illness, or the prospect of physical pain, fear is a fact of life in a fallen world. But how do we stare these difficulties in the face and not lose heart? By practicing the virtue of fortitude. In short, fortitude is the ability to choose what is right even when everything inside of us and outside of us is telling us to run away in fear. It is the ability to stand firm in pursuing good in the face of danger and potential suffering. Fortitude flows naturally from faith, hope, and charity. When we believe the promises of God (faith), and have confidence not in ourselves but in the strength of Christ (hope), and we are motivated by love (charity), we will find ourselves filled naturally with the virtue of fortitude. 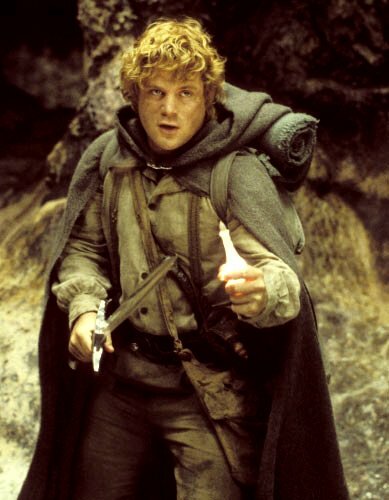 Courageous Sam, the real hero of Lord of the Rings. The Lord of the Rings movies are some of my favorite films. While the movies are not entirely faithful to the books, I believe they capture several key elements Tolkien was trying to convey—one of which is the fortitude and perseverance of the humble hobbits. One of my favorite moments from the series is in The Two Towers. After a long journey, Sam and Frodo are finally about to enter Mordor. They are tired, discouraged, and afraid of what awaits them. To add to their fear, the Nazgul are hunting the two hobbits relentlessly, and their chances of being captured or killed are astronomical. Frodo, bearing the burden of the ring, is on the brink of giving up and turning for home. Sam too, is tired and afraid, but unlike Frodo, he possess an inner strength—fortitude that propels him to keep pressing on. In a stirring speech, he reminds Frodo exactly why they can’t quit. It is one of my favorite movie moments. The key line in this speech is “Folk in those stories had lots of chances of turning back, only they didn’t. They kept going.” That is fortitude. Most of us in the West don’t have to face any real danger on a daily basis. But there are still ample opportunities for fortitude. Even crossing yourself and praying publicly requires a small amount of fortitude for most of us. Perhaps the most obvious opportunity for fortitude, though, is while watching the moral and social collapse of the entire Western world. Before our eyes, a once great civilization, built on the bedrock of a shared Catholic faith, is falling into ruin. The new tyranny of relativism attacks all that is good, beautiful and true, while increasingly criminalizing dissent in the name of tolerance. Violations of freedom of speech are rampant; the economy is teetering precariously; violence plagues our schools, shopping malls, and theaters; children are being sexualized; the family unit is crumbling; radical Islam is on the rise; the redefinition of marriage is celebrated. The list goes on and on. Frankly, it is all a bit terrifying, and I shudder to think about the world my children will grow up in. Indeed. Well said sir. Almost 3 and a half years later your words ring with even more emphasis and truth. The last days of the Obama regime stand before us, the uncertainty of the Trump presidency is immediately before us, and our Church seems to be feeling some uncertainty. I too shudder when contemplating the world my child will be inheriting. Let us continue to pray for the Church, our priests, our parishes and of course, our families; they are worth fighting for. thank you, great job on this. I’ve heard it said that fortitude is the bridge between us and our ideals. The greatest example is the crucifix. Excellent post. Also a big LOTR fan and am happy to see it referenced in an eloquent manner.